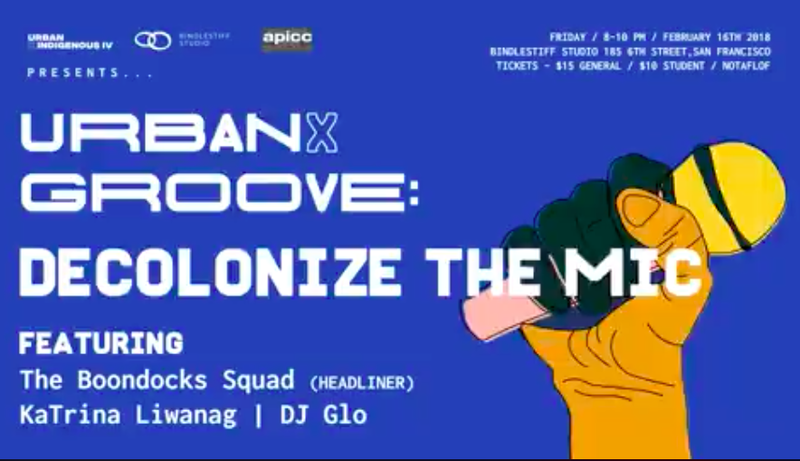 featuring KaTrina Liwanag, headliners Boondock Squad, with tunes by DJ Glo. Across the globe, the hxstory of colonization has resulted in the exploitation of indigenous cultures, the erasure of hxstory, and the denial of second class narratives. The effects of colonization continue to permeate our society, our politics, and our art --- but art is also our weapon in this war. For centuries, our ancestors used music, song, art preserve the stories of our culture. Music, especially, has been a way for people of color to speak truth to power, to let our narratives take center stage. On February 16, we're telling OUR truths, and re-indigenizing the musicscape! DJ Glo will be spinnin' slaps into the night, so come dance with us! Step up on stage for our open mic, share your music and your message. After KaTrina Liwanag closes the open mic with a magical set, we're keeping the party going with a powerful performance by headliner Boondock Squad. ADA accessible. All inclusive event. One Love & All Love. KSW Presents Building Legacies: 45 Years of Art and Resistance ft. RUBY IBARRA, JESSICA HAGEDORN, & BERNICE YEUNG! YOHANA x FMHI SF Present an Ignite Open Mic: "Mind, Body, Soul" at BINDLESTIFF STUDIO!